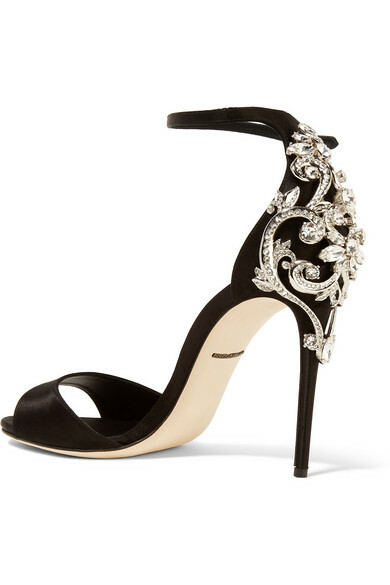 Glowy: Shoe Of The Day: Dolce & Gabbana Embellished Satin Sandals. Shoe Of The Day: Dolce & Gabbana Embellished Satin Sandals. Beauty is in the eyes of the beholder but mehn the beauty in this shoe is so enchanting that i know it will capture the heart of many who read this post......... it will be safe to describe this shoe as Medusa.....and when we say a shoe is medusa in nature, we simply mean when you gaze upon the shoe with your eye wide open. instead of turning into stone, you are raher drawn into a magical world of purchasing the shoe instantly without a second thought.hehehe..
Dolce & Gabbana’s sandals look sleek and classic from the front but turn to reveal an opulent crystal-encrusted filigree back. They’ve been made in Italy from lustrous black satin reinforced with supple leather. The styling possibilities are endless – try yours with an LBD or printed dress. The shoe retails for $1,995 and can be purchased at Net-a-porter.